As you keep hacking and slashing enemies, you will enter newer floors and confront deadly bosses. Every time you defeat a boss, you will get deeper into the dungeon and explore more floors until the next boss battle. Bosses don’t appear unless we summon them by tapping the yellow “Battle” button. Once the yellow battle button appears, check the difficulty level. Under the word “Battle” is the difficulty level, which ranges from “Ready” to “Impossible”. Ready means you are ready and can easily defeat the boss. You can’t win “Impossible” battles, so try to lower the difficulty level to “Hard”, which can be done by upgrading your weapon, armor and cloak. Keep defeating monsters to earn coins and distribute them to your equipped weapon, armor and cloak to upgrade them. Upgrade and keep an eye the difficulty level. It will change once your hero’s equipment becomes more powerful after upgrade. You can easily win “Very Hard” boss battles if you have a better build, have ascended and then spent tokens on select knight upgrades. You normally get runes after leveling up. Runes enhance your knight’s skills. You will get different types of runes for a single skill, so select them wisely. Example: For enhancing “Whirl” skill, you will get runes like “Frost” and “Push”. 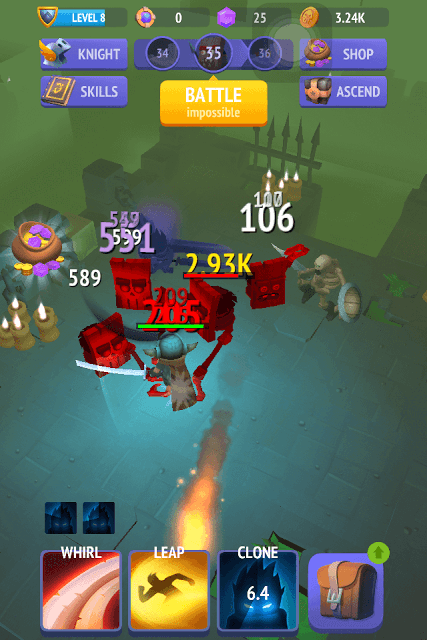 Now tap to select any rune of your choice, but choose that rune that inflicts maximum damage or has a better impact than the other. Push just knocks back nearby enemies, whereas Frost freezes nearby enemies for a few seconds. Similarly for the “Leap” skill, you can choose “Gold” that lets you earn bonus coins when the knight leaps and smashes the ground or “Double” that lets you gain two leap and smash charges. I preferred the latter as it allowed me to inflict double damage to enemies. Try experimenting with different runes for each skill to come up with a better combination that can deal extra damage to enemies. Look for “Double” runes for each skill you have unlocked. With such runes equipped, your knight will gain two charges. So for a Double Clone, you will get two fighters helping your knight battle monsters. You will have to tap on the clone icon two times to summon two fighters. One of the key gameplay features of an idle clicker game is Ascension. You will be given a choice to start from scratch with some extra perks that will make you stronger/faster. However, some benefits such as equipment and resources will be snatched away from you. Nonstop Knight’s “Ascend” option lets you do exactly that. It lets you start from floor 1, but will provide tokens and some extra rewards. The tokens can be used to upgrade your knight. Upgrades will be permanent and will greatly benefit your knight in his fight against monsters. You will keep all runes you have earned so far. The only disadvantage of ascending – your items (weapons/cloak etc.) and coins that you have collected so far will be lost. When the Ascend option gets activated, you have the option to select it and start from floor 1 or wait until you get some more tokens. I chose to ascend when my token count was 900, and I received all those tokens immediately after ascension. Spend tokens on knight upgrades wisely. Spend them on Coin Gain, Damage and Skill Damage upgrades first. You may later spend tokens to purchase Armor and Token Gain. Look for free rewards on the Shop menu. These rewards are granted when you watch a short advert. Rewards could be anything from coins to revives. Save gems for tokens. This offer usually appears after Ascending for the first time. You will get 540 tokens for 50 gems. Equip the right weapon/armor/cloak that deals maximum damage to minions and bosses. Check their rarity and the perks they grant and choose those that grant more than one perk. For example: The 3-star Emperor Cape received from the Fisherman’s Chest provides 23 percent armor, 30 percent damage and lets your knight gain double damage when full HP. Items that you gain from Fisherman, Swamp, Frosty, Trickster and Magma chests are better than items that you get from Wooden, Bronze and Silver chest. Fisherman chest is probably the first chest you will receive that drops 2-3 star items.